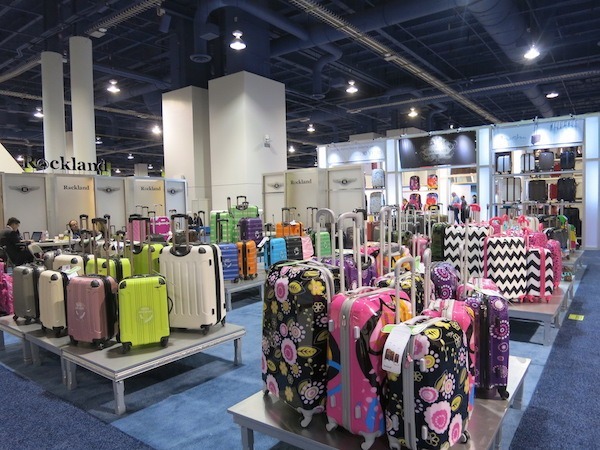 We had the chance to attend the International Travel Goods Show in Las Vegas in March. 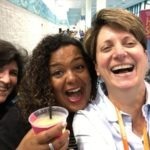 You can imagine how our heads were spinning as we walked the convention floor trying to take in nearly 300 vendors displaying their wares. Rather than try to cover everything, we thought we’d break it down to the top 18 travel goods we think will make your travels easier. For high-end designer bags to light-weight carry-on’s they had it all. More colors, shapes and sizes than ever before. The most extravagant was the Space Case 1 by Hontus. This ultra deluxe model has it all: built-in biometric fingerprint lock, self-weighing scale, GPS enabled global tracking, built-in power bank that can charge a cell phone up to 7 times and a built-in Bluetooth speaker. 20″and 29″ sizes are available starting at a MSRP of $2,000.00 for a set of two. If you’re a chef or travel adventurer and need to pack some wet items separately the Athalon 32″ XLG Super Organized Wheeling Duffle is for you. Retail $119.99. We were also intrigued by the Genius Pack carry on spinner, which uses a new laundry compression technology that separates your dirty clothes and flattens them to leave more space for taking those extra little goodies home. Starting retail at $238.00. Another interesting bag is the Haiku Bag – 100% recyclable- it’s a terrific looking bag that helps the environment and keeps you on the go. Starting at $35.00. 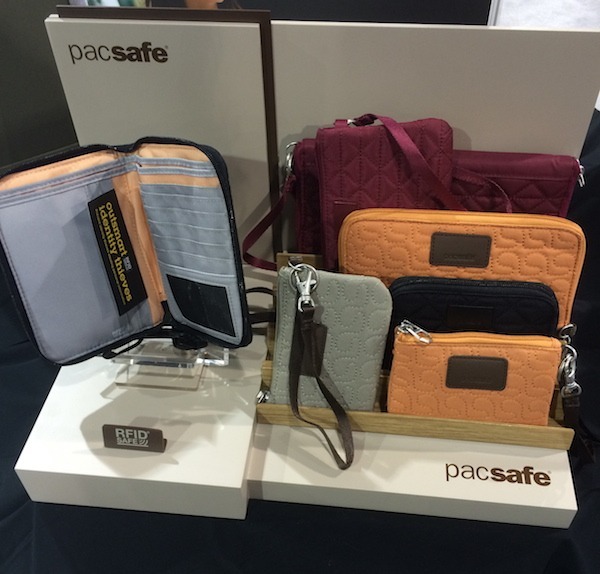 Pacsafe, a brand long committed to providing safety in travel, had a lovely new line of ladies bags. They look great and provide the many Pacsafe safety features. The new Pacsafe RFID Safe W150 RFID Blocking Organizer caught our eye as not just great for travel but also for everyday if you don’t want to lug around a huge purse (me) but need to carry your phone, credit cards and few essentials. Retail $55.00. Safety also came in the form of RFID blocking technology in money belts from Lite Gear. Making it easy to keep your valued possessions with you and protected. The Feather Lite belly band provides 7 pockets to securely store your essentials on your body safe and sound. Retail $19.99. If you have someone who attracts mosquitos in your traveling party (like we do) you must check out the new line Nosilife Insect Shield Insect Repellent Apparel from Craghoppers. Repels mosquitoes, ticks, ants, flies, chiggers and midges. Available in mens and women’s styles and sizes. Starting at $35.99. 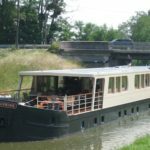 Traveling to a country with spotty electric service? The NiteCore Tiny USB Rechargeable Light Tube keychain flashlight is mini, lightweight and rechargeable through a USB port. It’s super bright at 45 lumens. Genius! Retail $9.95. If you’re in need of clean water try LifeStraw personal water filters. They remove 99.9999% of waterborne bacteria and surpass EPS standards for water filters. Filters up to 1000 liters of contaminated water without iodine, chlorine or other chemicals. We also love their Lifestraw Follow the Liters program. For every LifeStraw product you buy, one school child in a developing country receives safe drinking water for an entire school year. Starts at $19.99. Other popular items were travel locks and luggage scales. 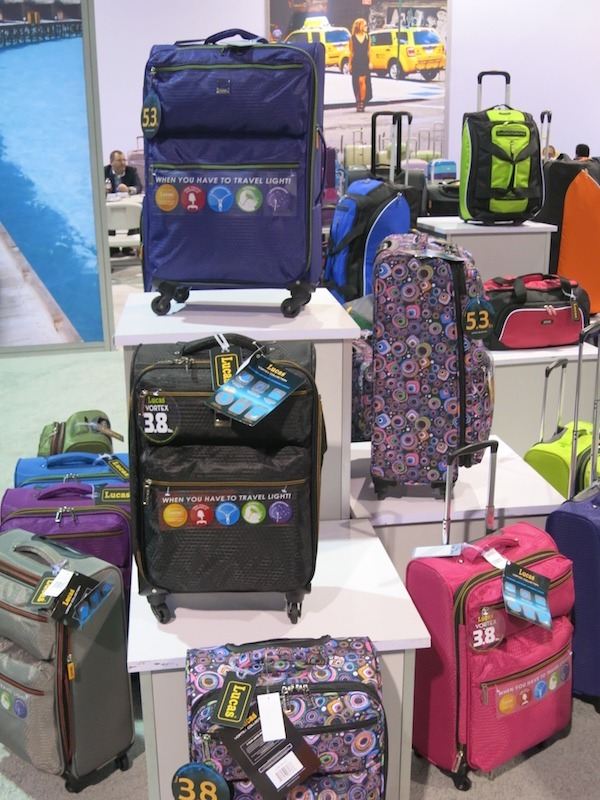 Keeping luggage safe and underweight to avoid the excessive bag fees have made this a hot category. The SearchAlert travel lock from Sesamee features a green and red indicator to let you know if your lock has been opened by TSA. The Balanzza USB premium luggage scale is ergonomic and compact and easily rechargeable via a USB connection. Retail $29.99. Use a sleep mask or pillow when you travel? 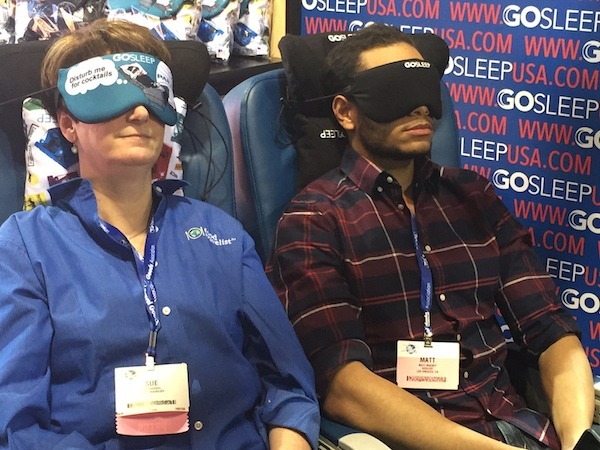 You have to check out the GoSleep eye mask and memory foam pillow that’s in an easy-to- carry case. I tried it at the show and almost fell asleep. They have fun designs, including a Pan Am collection. Retail $38.00. Going to a hot and steamy climate? Or working outside in the summer heat? Blu Bandoo cooling headwear is perfect for you! Soak it in water for 5 minutes. It dries completely to the touch and keeps you cool for hours – even days! I tried it on at the show and it cools you off immediately. Reusable and hand washable, there are styles perfect for sports, work and travel. Starting at $9.95. Compression socks. I’ve been a fan for years and never fly without them. If you want to reduce the risk of blood clots from lengthy journeys or just want your feet and legs to feel better, you gotta try a pair. The good news is these are not your Grandmother’s compression socks they’re now available in fashion colors and all kinds of stylish designs. I even love to wear my compression socks while walking trade show floors or wandering the streets of Paris. This year to my complete joy there were more compression sock vendors than ever before. In fact, we’re going to do a complete review of travel compression socks very soon – so stay tuned. Can’t fit everything into your carry-on and personal bag? 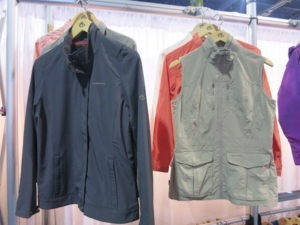 How about trying Stuffa’s stylish vest or coat with 12 pockets that holds up to 11 lbs!! Ever leave a charger behind during your travels? Or worry someone is going to take your device at a charging station? The clever Charger Leash has a built-in alarm that warns you if you’re leaving your power accessories behind. Retail from $22.99. 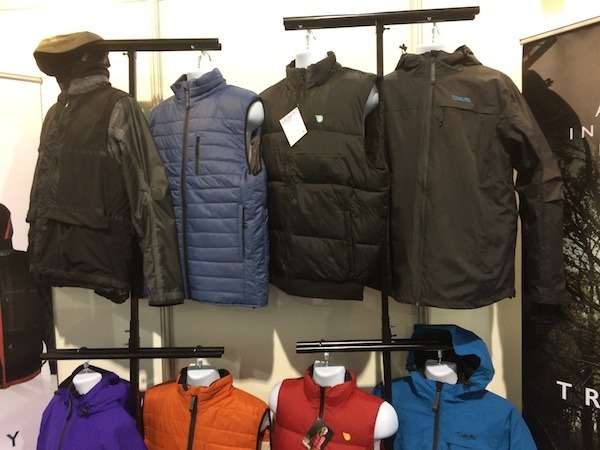 This is just a glimpse at all we saw at the 2015 International Travel Goods Show. We hope you enjoyed the recap. Let us know what you liked and what you’d love to see that would make your travels just a bit easier. 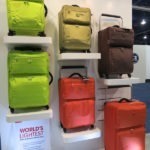 THE QUICK BITE: We bring you 18 of the best and most unique travel accessories from the 2015 International Travel Goods Show in Las Vegas. Oh oh, I want that eye mask!! It looks amazing and was one thing that I always made sure to carry with me, especially for train travel. But that one looks so much nicer than the crap ones I always carry! Wow! Thank you for breaking everything done and coming up with this list! It is so helpful! I would have definitely been overwhelmed with all these stuff at the convention. 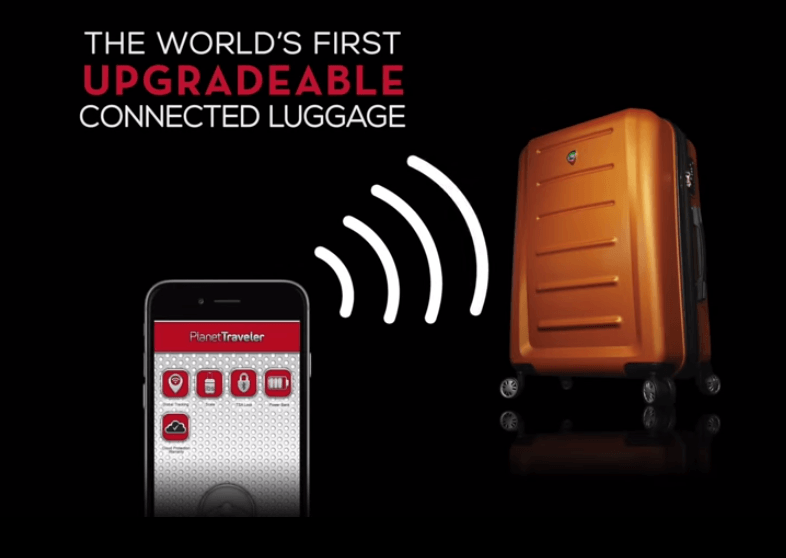 It is amazing how they are constantly improving travel accessories. I will definitely look into the insect repellent apparel as well as the face mask. Great post! It’s nice to see Pacsafe on the list. Great list!!! Very good travel items you have there! This is an awesome compilation Sue! I find most of the ones you listed as truly important, as for the others, I haven’t really owned them but it’s worth looking into! Nice list – I have a SOLDIT scarf which I LOVE – it’s one of those scarves which has hidden pockets in it for all of your stuff – so much easier than carrying a bag when you’re overseas. Love it! Ha, the stuffa really makes me laugh. Perfect for those budget airlines that restrict you to one case of hand luggage only!!! Exactly! Just carry it with you in your jacket, brilliant! Lots of fun accessories here! I’ve been wanting to try the LifeStraw out–sounds like a great thing to have. Love packing cubes too! Hi Jenna! I’m in love with packing cubes too. Happy travels! It’s in Vegas in March next year too so mark your calendar Stacey! Get the socks they are moisture wicking too so great for backpacking and adventure travel. Thanks for stopping by! We’re going to SE Asia this coming summer, Craghoppers’ Insect Repellent Apparel should be on our list. We are magnets for mosquitos. Also could use LifeStraw’s Personal Water Filter. Thanks for the recommendations! Hi Brenda! Both of those items would be great for your visit to Asia. Happy travels! I’m with you on the eye mask. I can’t sleep unless it’s completely dark so it’s a must for me. Thanks for stopping by! I have no idea how you narrowed the list down to 18! Thank you so much for doing the legwork for all of us! Ha ha! No kidding Suzanne I could have easily been 118! Thanks for stopping by! Some interesting items for sure, the Charger Leash is intriguing, I wonder how well it works. We saw it demonstrated at the show. The alarm goes off as soon as you take off whatever device you have attached. That way you won’t leave the rest of the charger behind. Works great. I would love to get one of those fancy suitcases and also a Blu Bandoo cooling headwear hat. I’ll be watching for them. You can order BluBandoo from their website or pick them up in specialty stores. Thanks for stopping by Carole! This is great info! We definitely need to get our hands on that charger leash. We’re quite forgetful! The Charger Leash will definitely solve that problem! What fun it must have been for a travel lover to see all these neat things! It’s a little overwhelming to be sure – but a lot of fun! Will definitely be looking into LifeStraw, seems like a fantastic product with a wonderful ethos behind it. I love finding companies that give back in some way. Totally agree! We love supporting companies that help the earth and the people on it in positive proactive ways. Thanks for stopping by. I’m a sucker for nice luggage. Great post! So many great products!! I didn’t know that most of these were possible or even existed! The cooling headband sounds like a lifesaver, I don’t do well in hot/humid climates. Thanks Valerie! You will love BluBandoo give them a try! I don’t actually have to much “travel gear” but I love my packing cubes and I really want to get one of that infinity scarves with a pocket. Oh my gosh, so many travel gadgets I never knew I needed–but that I now want! I love the idea of he Genius Pack with the laundry compression technology, but with them starting at $238, it’ll be a while before I spring for one. I don’t really use a lot of accessories like those when I travel but I’ve been considering those socks for a while… And not just for flying, you mentioned using them for long shows or walks and that sounds great since sometimes my legs just feel a bit heavy, might have to look into that! I highly recommend that you try a pair. Your legs and back will definitely thank you. I’m working on a post comparing the socks I’ve worn so stay tuned. Very many clever ideas! I particularly like the personal water filter. This should come very handy in backpack trips. I am a sucker for travel gear and gadgets. I’m always in search of the perfect this, that and/or the other. 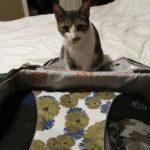 I actually have been a fan of Lucas luggage for some time, precisely because their products are light and in our experience they’ve been durable. 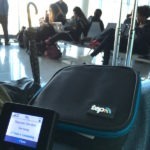 You have also prompted me to check out some PacSafe products for an upcoming trip to Spain. Finally, those BluBandoo cooling hats and scarves almost make me want to be going somewhere very hot so I could try one out. It’s too bad I didn’t have one of their hats during our recent visit to Masada in the Judean Desert in Israel where the heat really got to me. Glad to hear you’ve had great experiences with the Lucas Luggage Suzanne. We love PacSafe and have purchased several accessories from them which are terrific. I’m a BIG supporter of BlueBandoo they stay really cool and aren’t dripping wet with I had one with me on our trip to Cuba! Wow – Look at the luggage! This sounds like such a fun show to visit and there are so many clever ideas. I know! They have so many crazy colors and patterns now. It’s definitely a great show to see all the latest and greatest in travel accessories. Cool travel stuff. I want all of it. I’m especially intrigued by the insect repellent apparel. I may look into that for use at home during my Manitoba summers. We’ll be trying some this summer as well and let you know how it works out. 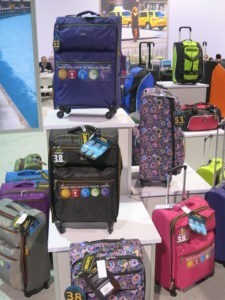 I love all the wild colors in the luggage! Makes it easy to spot on the conveyer! I know! It’s amazing how many colors are available now. Funny how most people still stick with the basic black. Absolutely! Thanks for stopping by Betsy. Handy post! I’m a mosquito magnet so would definitely be interested in the Nosilife Insect Shield Insect Repellent Apparel from Craghoppers (and a suitcase that would survive more than one or two trips). I’ve often wondered about the face mask — could result in better/more sleep while on the road/train/plane, etc! Hi Josie, definitely give a sleep mask a try. It really helps on those long flights. I can’t sleep in the light so I always have one with me. Thanks for stopping by.